Suggest that you make yourself a tea or coffee, this one is rather lengthy. 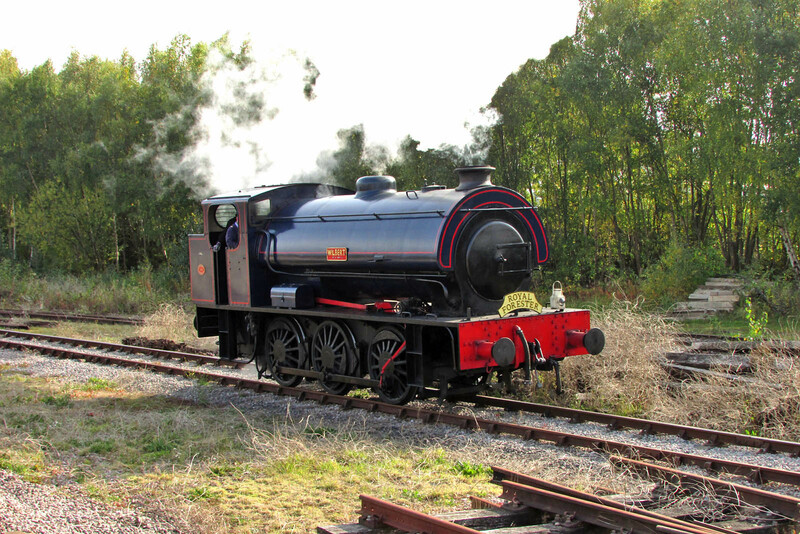 LMS Hughes Fowler "Crab" 13065, completed at Crewe in August 1927, and rated 5MT in BR days Normally kept at the East Lancashire Railway. This locomotive was allocated to 19E Belle Vue (Manchester) when BR was formed in 1948, and after allocations to Rose Grove and Fleetwood, it was withdrawn from 8H Birkenhead in December 1966. 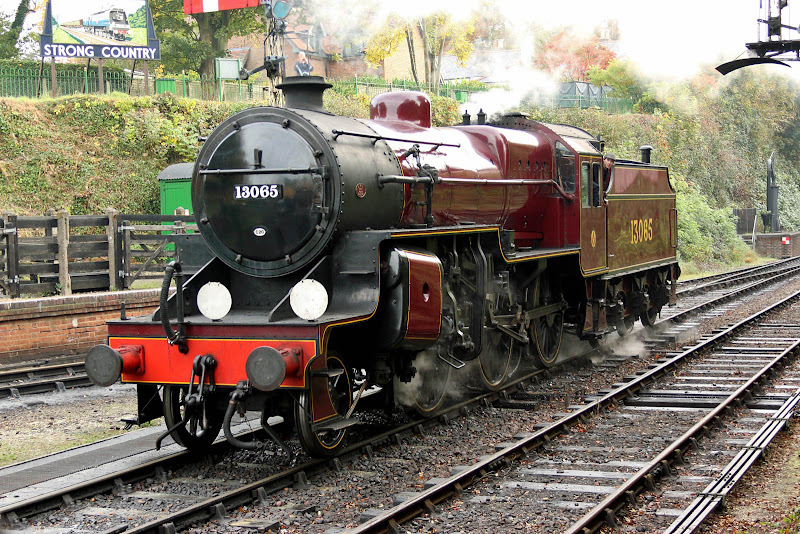 Sent to Barry Scrapyard, from where it was recovered to the Keighley & Worth Valley Railway before movement in 1992 to the East Lancs to complete its first restoration. 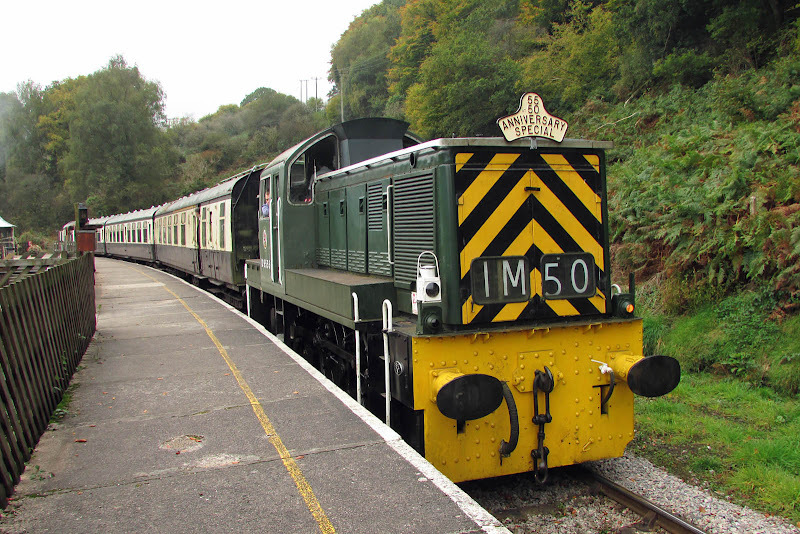 13065 arriving at Ropley from Alton and Medstead. 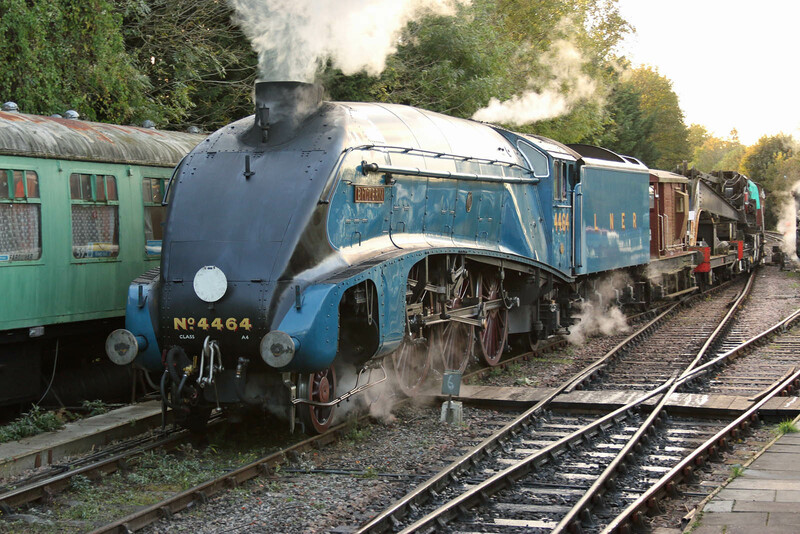 LNER A4 4464 Bittern (Doncaster, 1938) was on its last day in steam before overhaul, but that plan has changed. 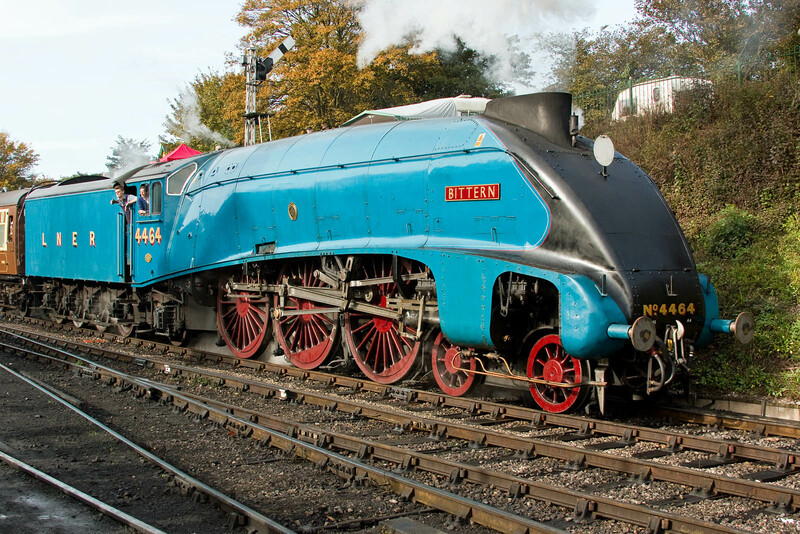 On Thursday morning, 29th October, the locomotive was seen being moved along the M27 near Fareham, as it is to substitute for 70000 Britannia on the Bluebell Railway at their 'Giants of Steam' gala. 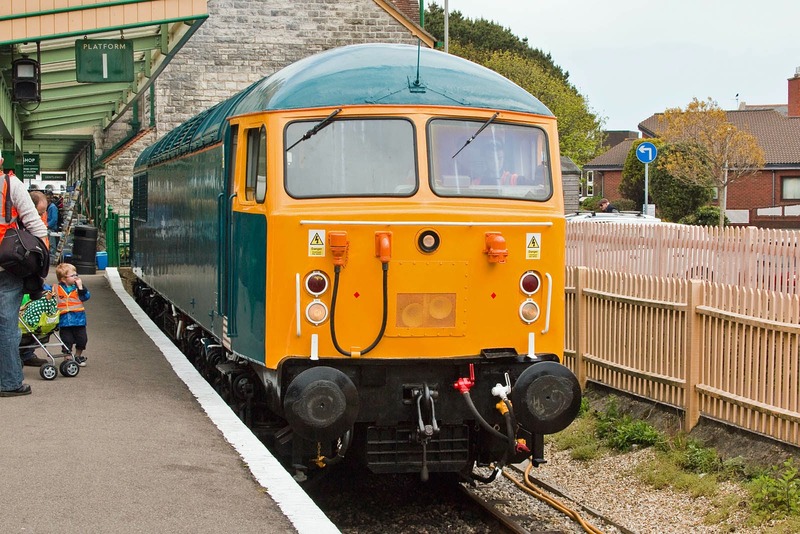 Seen here at Ropley. 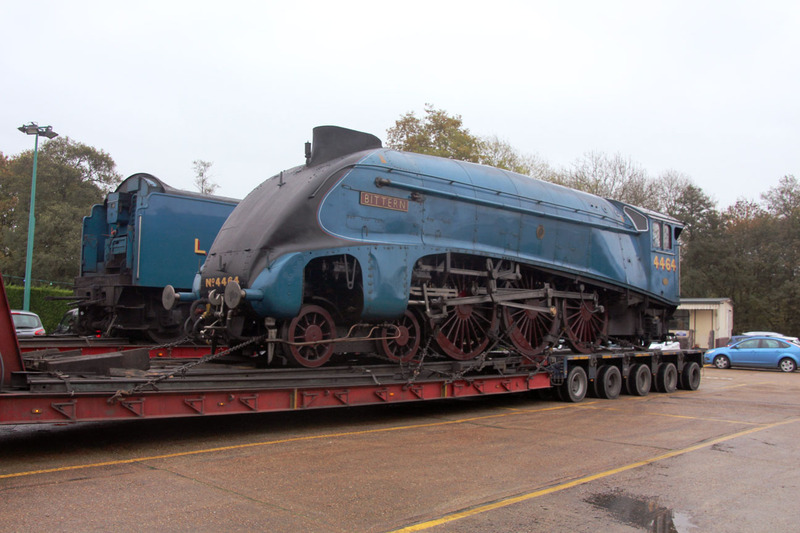 The last working (of the day) for the A4 was with the crane, being moved to Ropley from Alresford. 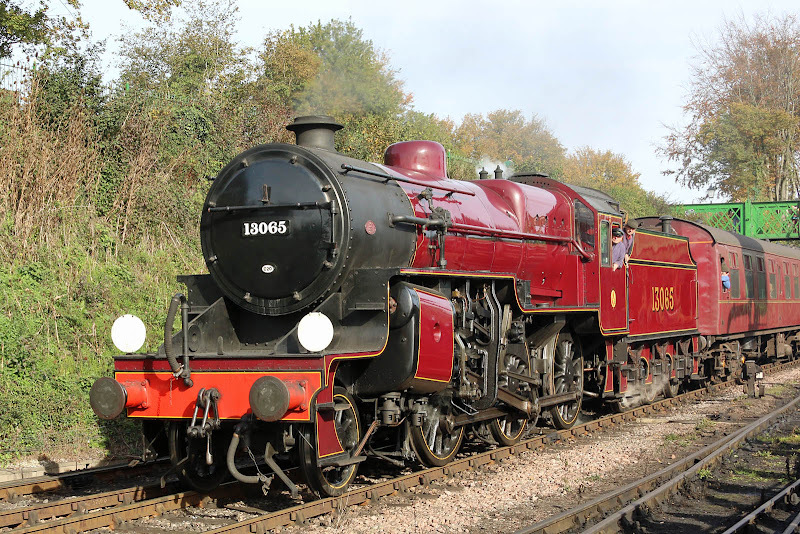 850 Lord Nelson (Eastleigh, 1926) will also bow out soon, coming to the end of its boiler ticket. 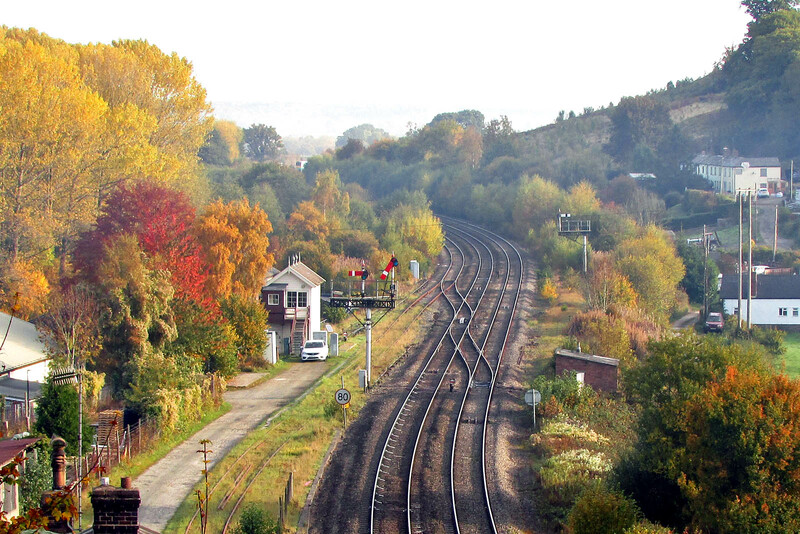 Coming onto a train at Alresford. 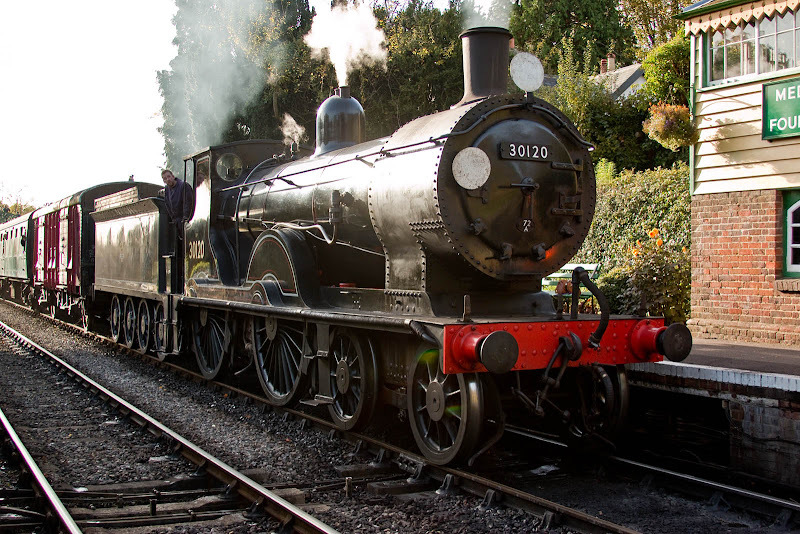 LSWR Drummond T9 30120 (LSWR Nine Elms, 1899) is seen at Medstead with a train for Alton. 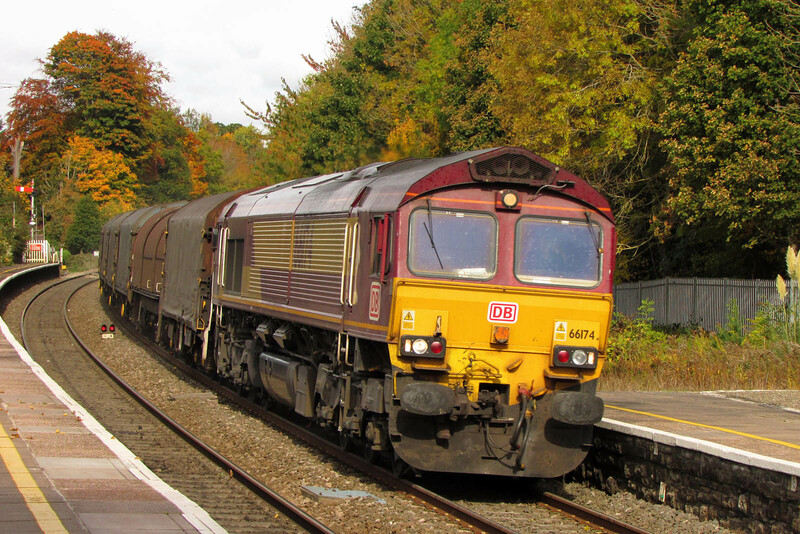 66562 + 66952 + 66551 0Y20 10:03 Stoke Gifford - Eastleigh convoy at Romsey. 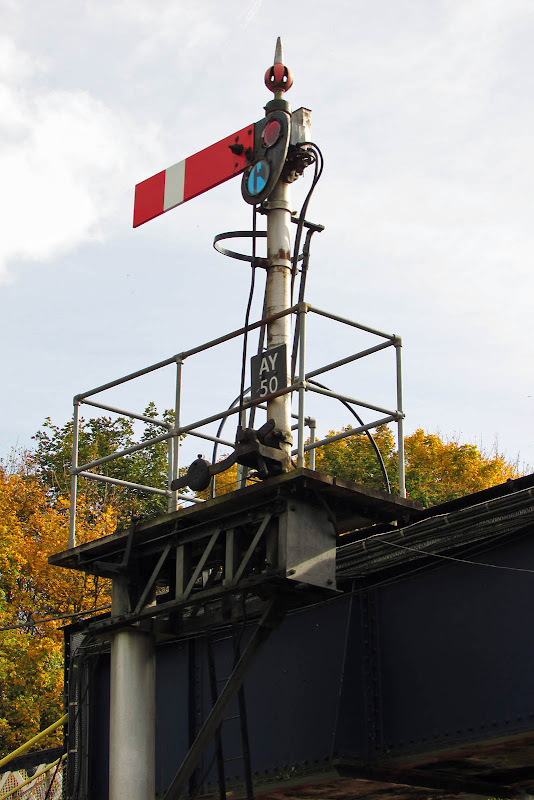 New temporary speed restrictions, and also a new safety platform and rail at the ground frame. 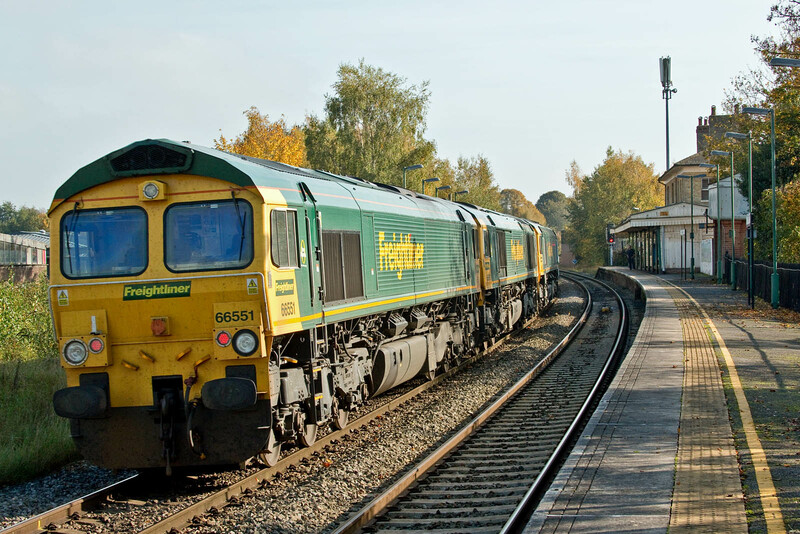 The train was 14 minutes late, but was re-routed by Chandler's Ford to make on-time arrival at Eastleigh. 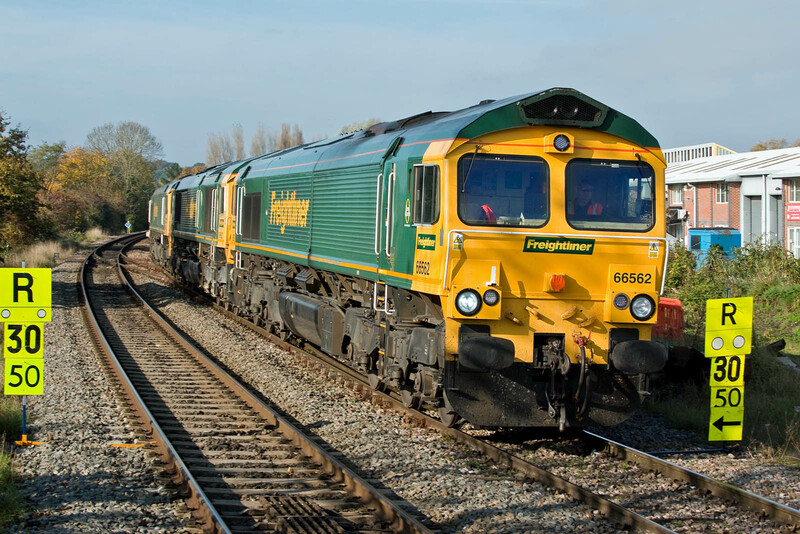 The EWS convoy from Margam / Westbury has been re-scheduled to run an hour later, now 17:25 at Romsey (and after dark). 66174 passes Abergavenny with 6V75 09:30 Dee Marsh to Margam. 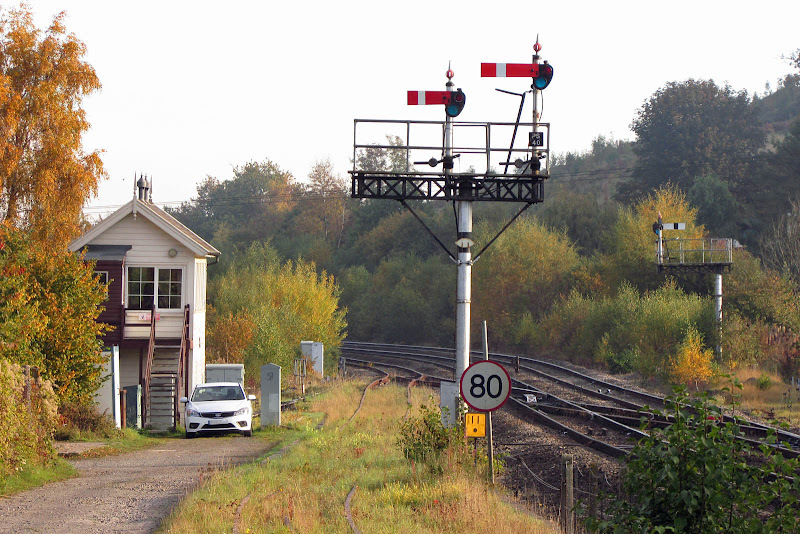 The Up Advanced Starter AY5 is at the end of the long platform. 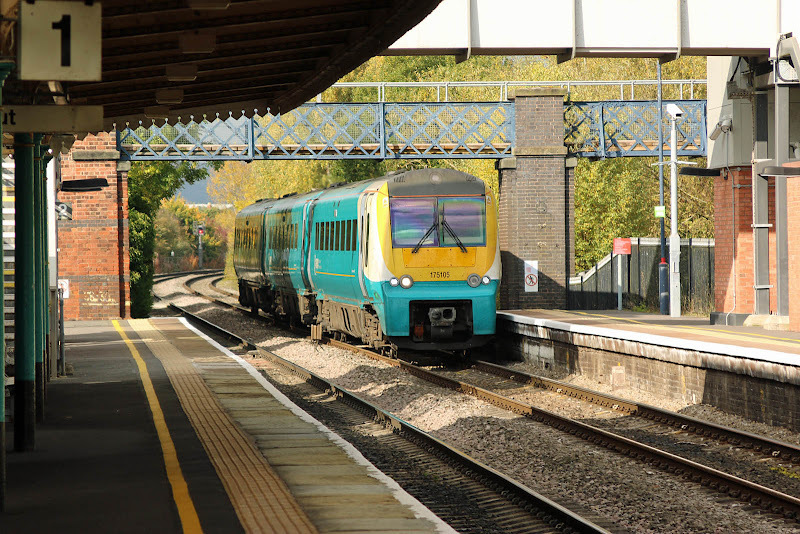 175114 arrives with 1W94 13:21 Cardiff - Holyhead. 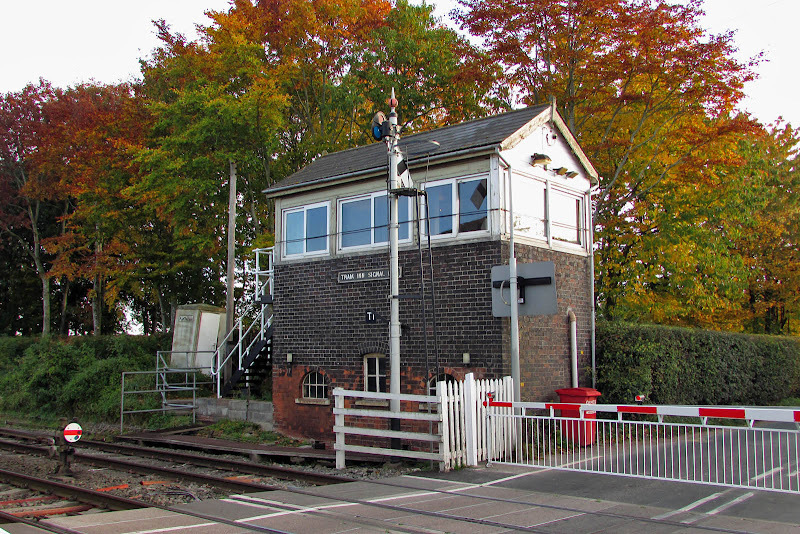 Abergavenny Station (AY) signal box is a GWR Type 28B, completed in 1934. AY44 Down Starter and siding exit. 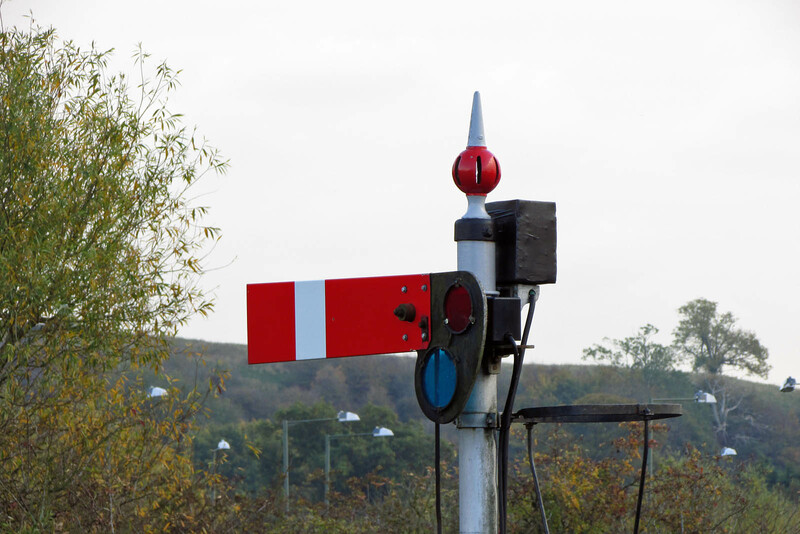 On the right is a yellow disc for setting back moves from the Up Goods lines. 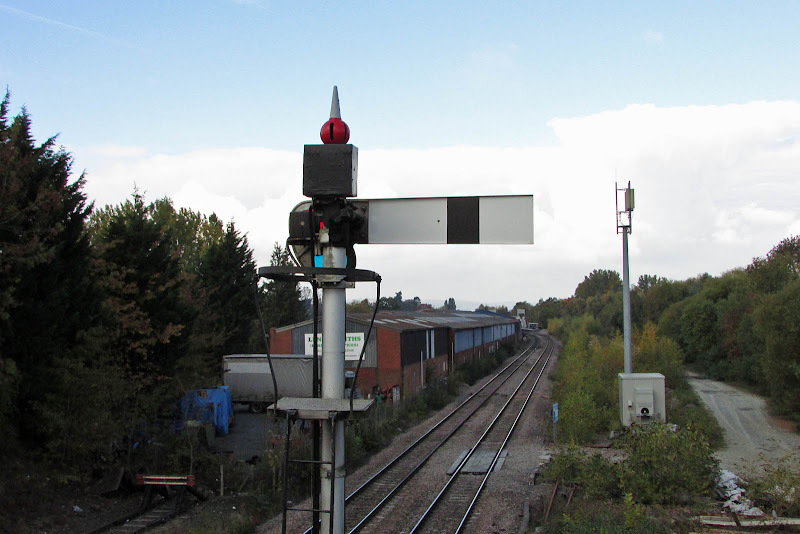 A closer view of AY50 in the 'off' position. 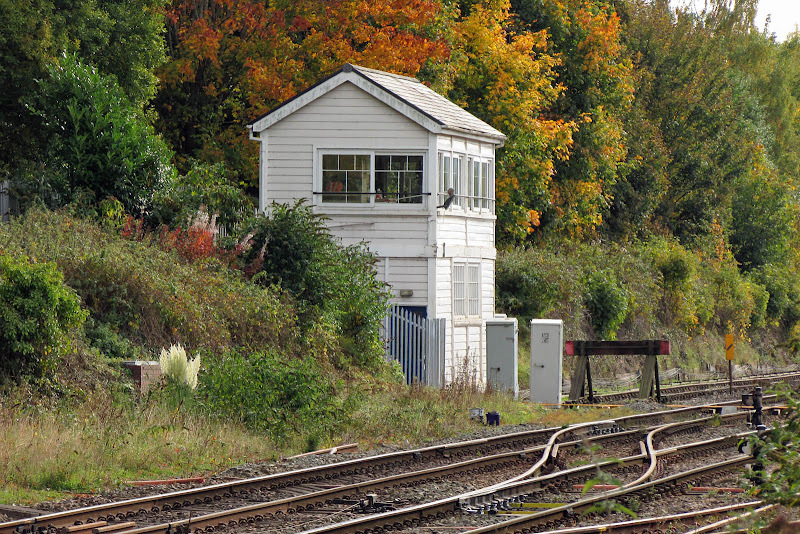 Mackenzie & Holland Type 3 box for GWR, built 1880, refurbished in 2009. 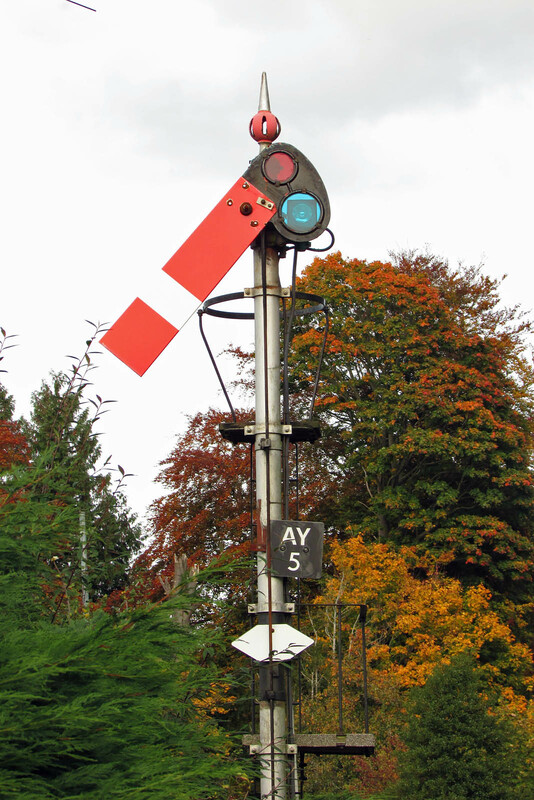 The Up Inner Home signal, with control of entry to the Up Goods Loop. 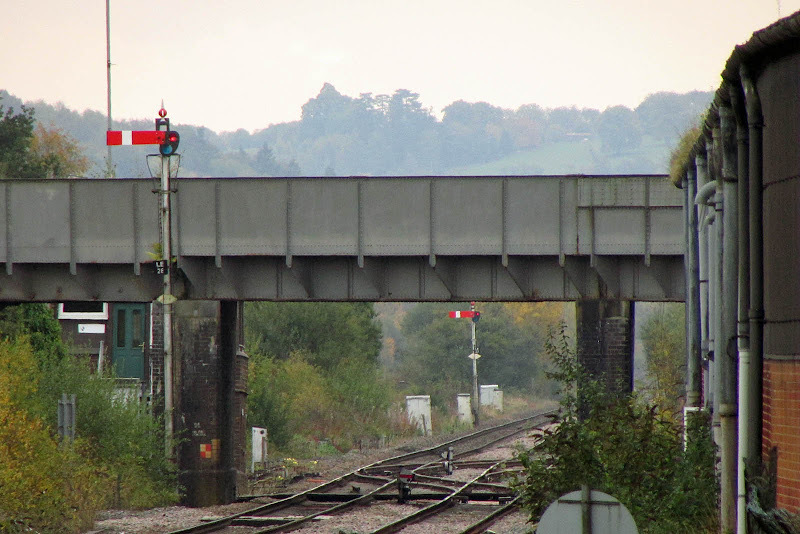 The Golden Valley Railway to Hay on Wye branched to the left at this point, represented by the empty signal location, but all closed by 1957. Up (northbound) 1W52 05:55 Milford Haven - Manchester Piccadilly can be seen disappearing in the distance. 175102 passes with 1V35 07:30 Manchester Piccadilly - Carmarthen. New Class 73 variants at Eastleigh, 24th October 2015. I am not alone in thinking that 73951 looks weird. No cab-end jumpers above the buffer level, and a new windscreen wiper arrangement. However the slots at cantrail level are reminiscent of the Bulleid / Raworth locomotives, the first Class 70. As an electric locomotive it is relatively unchanged. The diesel power is 2 @ 750hp Cummins QSK19 diesel engines & 2 @ Marathon Magnaplus alternators. 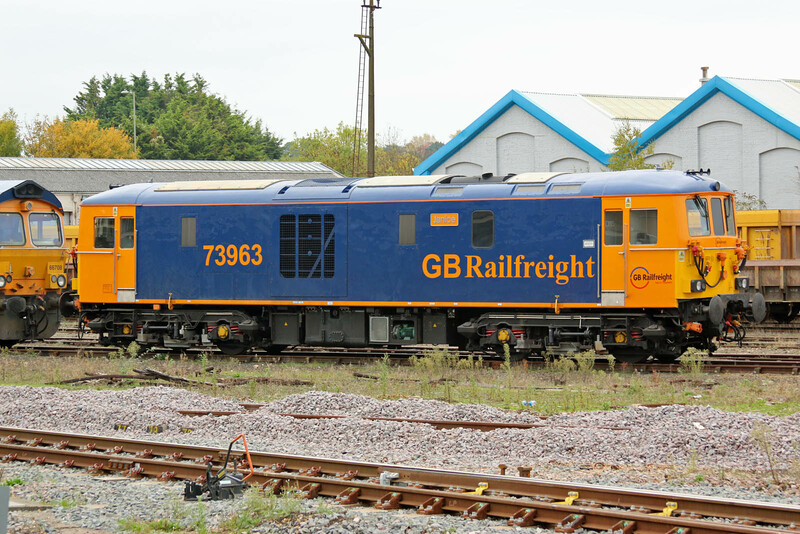 73951 was 73104, originally supplied from English Electric Vulcan Foundry in November 1965 as E6010, allocated to 75D Stewarts Lane. After withdrawal this was in ownership associated with Fragonset and was very occasionally active on the Mid-Hants Railway, later at the Weardale Railway. 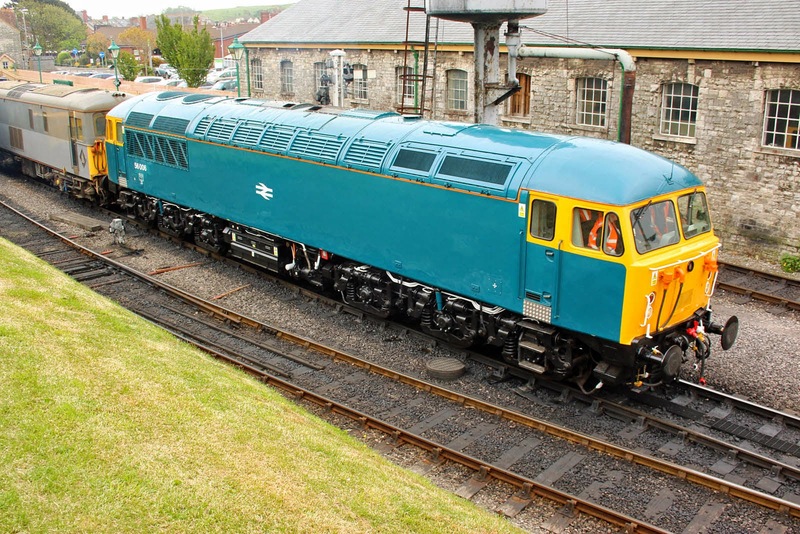 Bearing more of the classic lines and layout of Class 73 is 73963 Janice. Originally E6030 delivered in May 1966, this became 73123 and later 73206 in the sub-class for Gatwick Express duties. 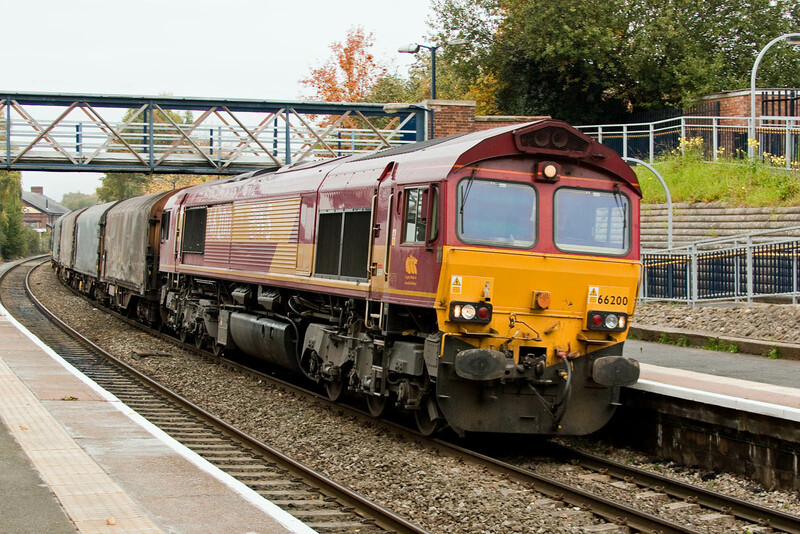 As 73963 this has been re-powered with a MTU 8V4000 R43L of 1600hp and Lechmotoren SDV 87.53-12 alternator. Again, as an electric locomotive it is relatively unchanged. 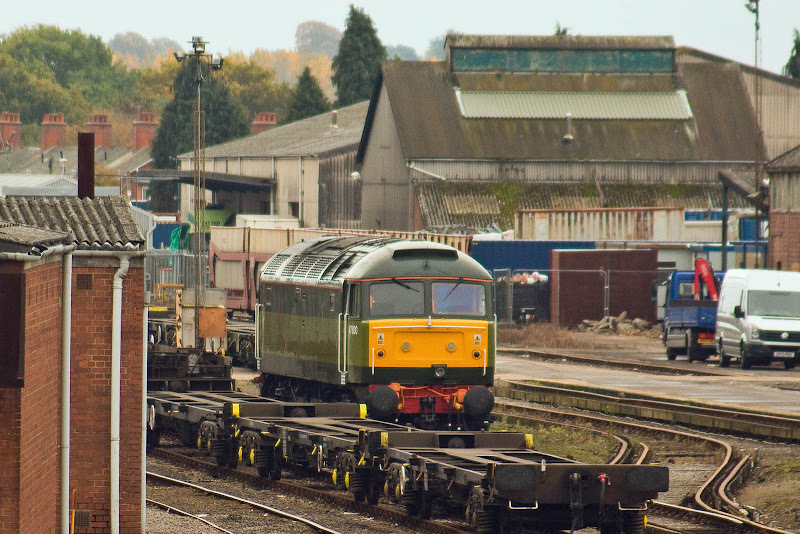 47830 at Eastleigh Works, 24th October. 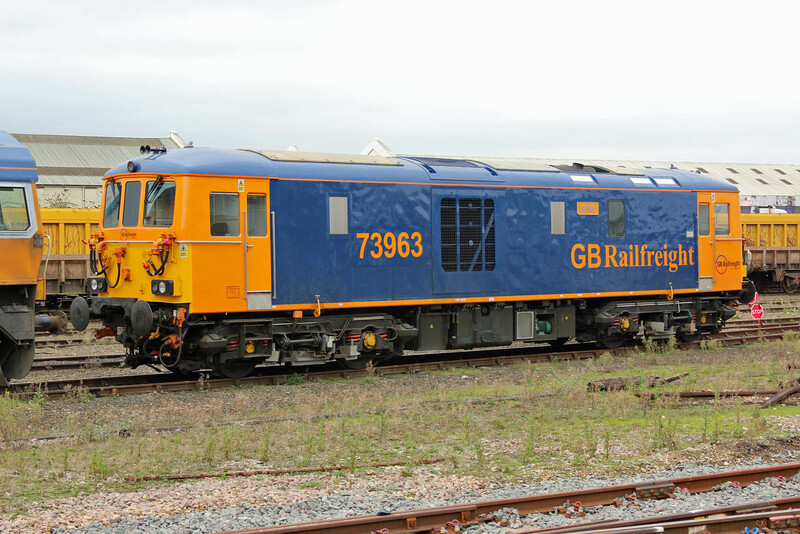 66848 (formerly 66575) at the same time. 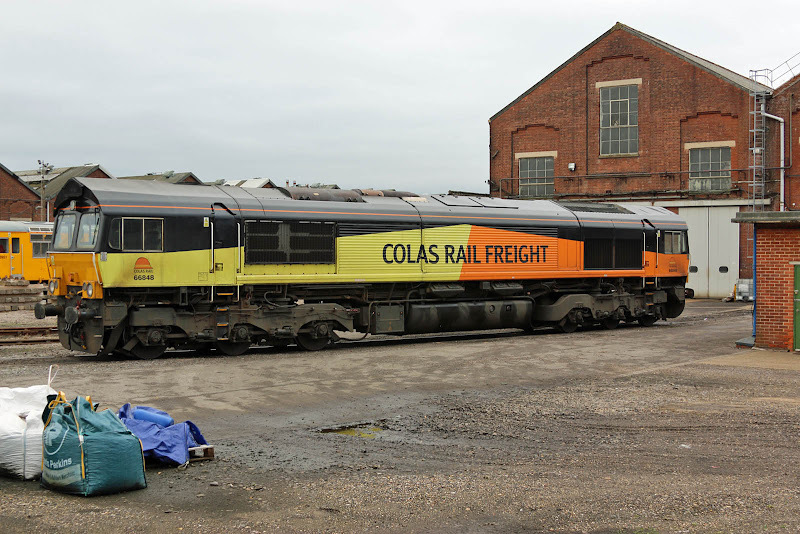 08696 (Polmadie) has arrived at Eastleigh Works for attention. 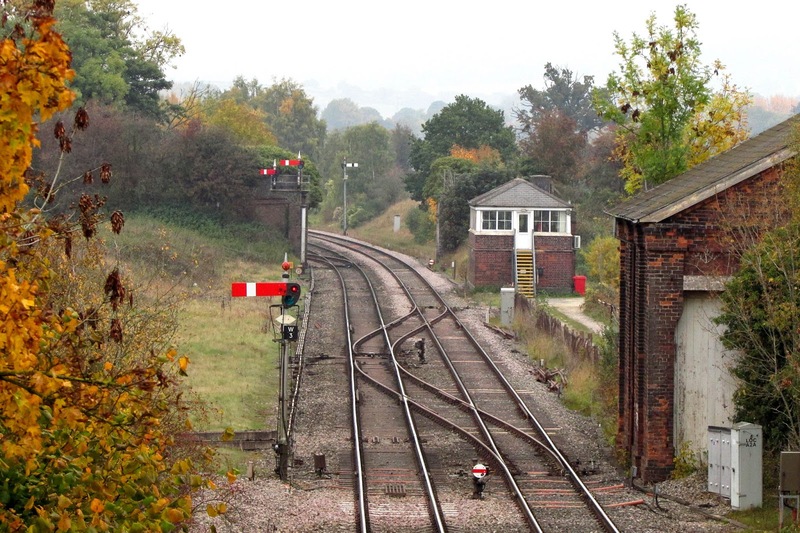 Woofferton Junction (W), with up goods loop starting in upper left, mainly out of sight. 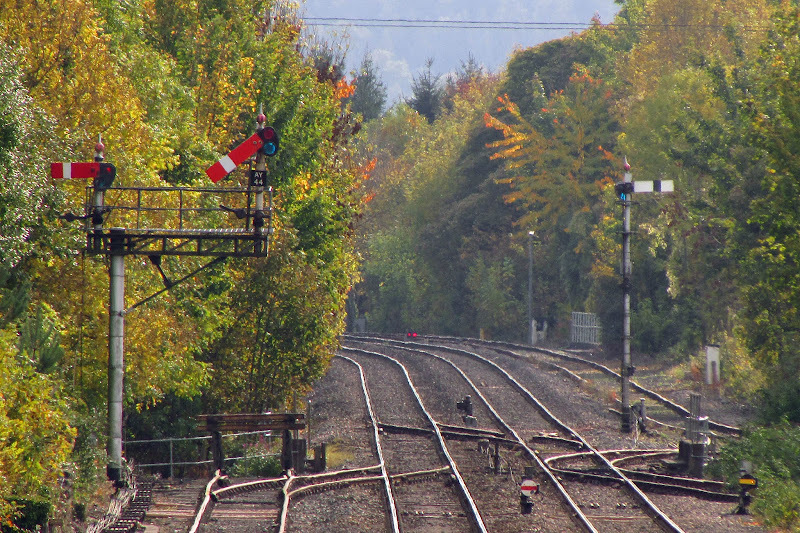 The branch to Tenbury Wells & Bewdley diverged to the right before the signalbox. 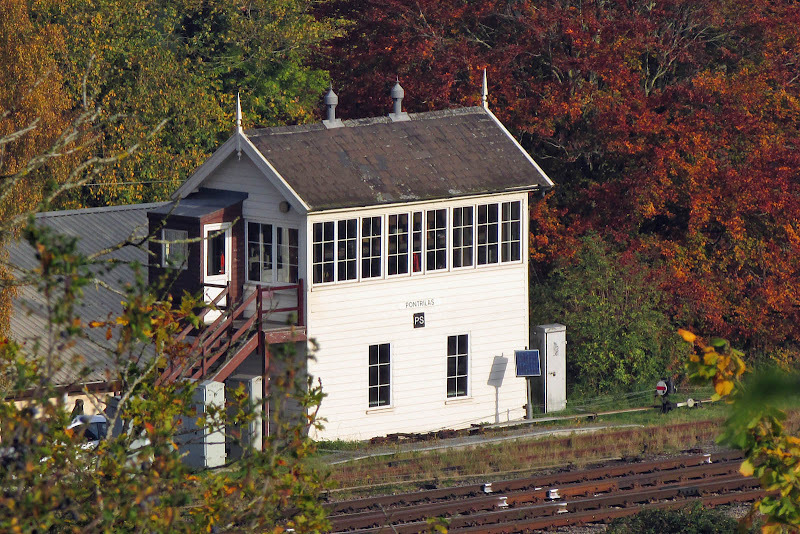 The signalbox was completed about 1875 and is to a LNW/GWR Joint Type 1 pattern. 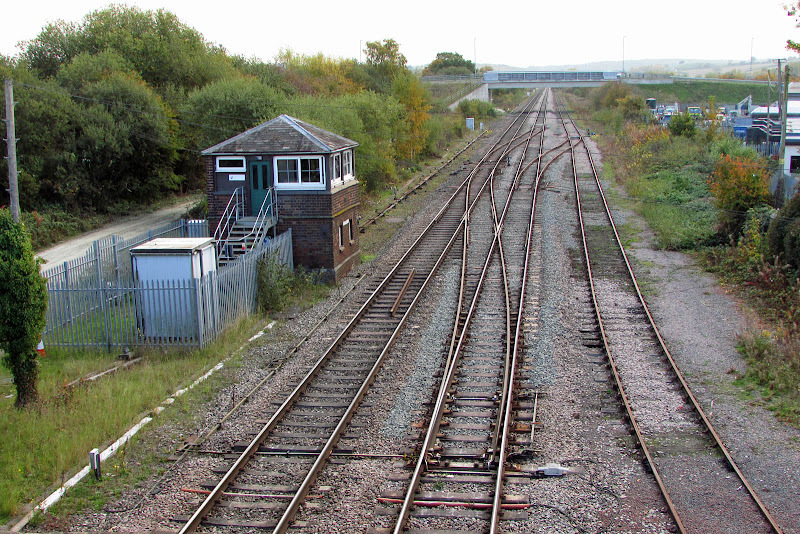 The remaining signalbox at Leominster ere is the former Leominster (South End) (LE), again to LNW/GWR Joint Type 1 pattern completed about 1875. 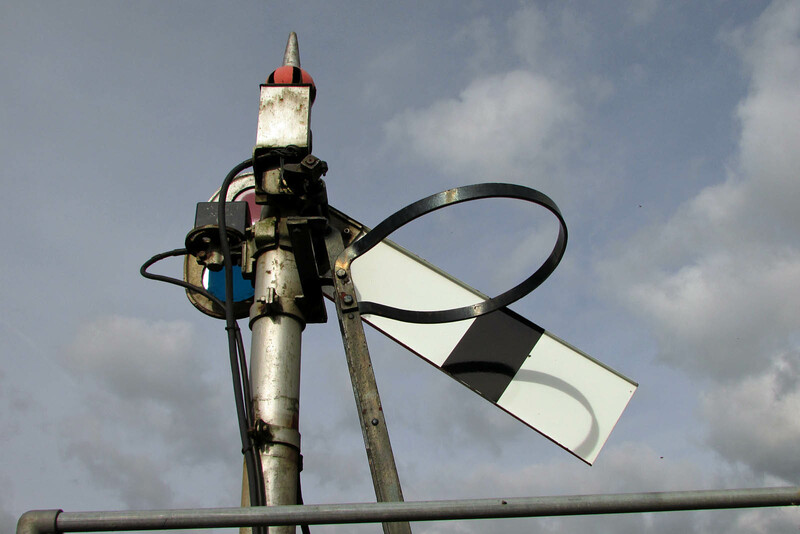 Two perspectives of home signal LE28. View from the station of the down home and starter signals. 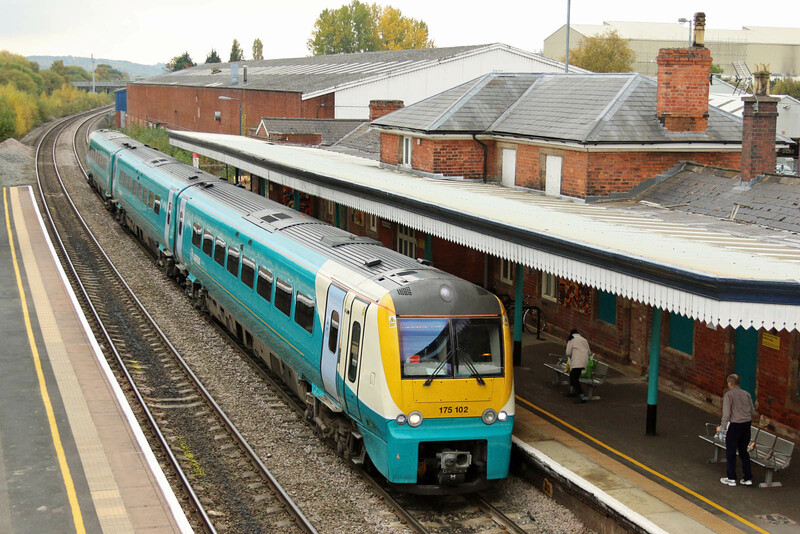 175010 arrives at Ludlow with 1W92 09:21 Cardiff - Holyhead. ... with no other coaches and power provided by 67001. 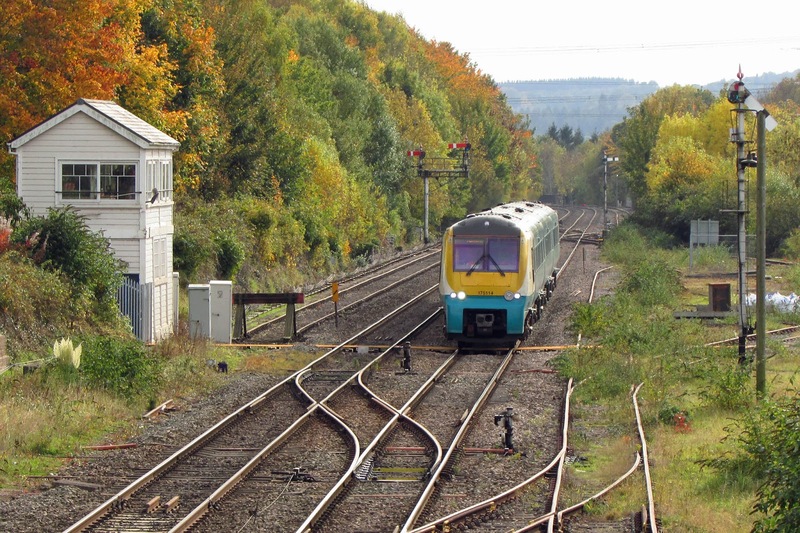 175001 was working 1V38 09:30 Manchester Piccadilly - Carmarthen. 66200 leads 6V75 09:30 Dee Marsh to Margam. 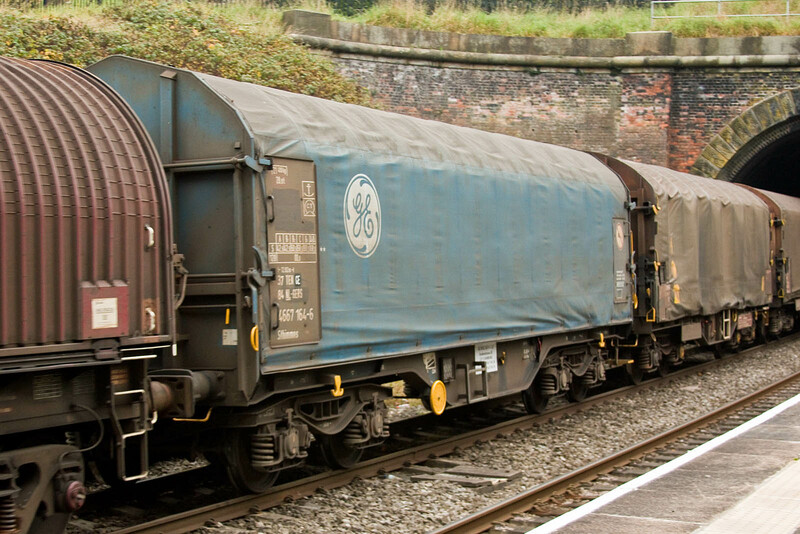 37 84 4667 164-6 is an IHA Bogie Canvas Enclosed Steel Carrier, built by IRS in Romania between 2008-09. 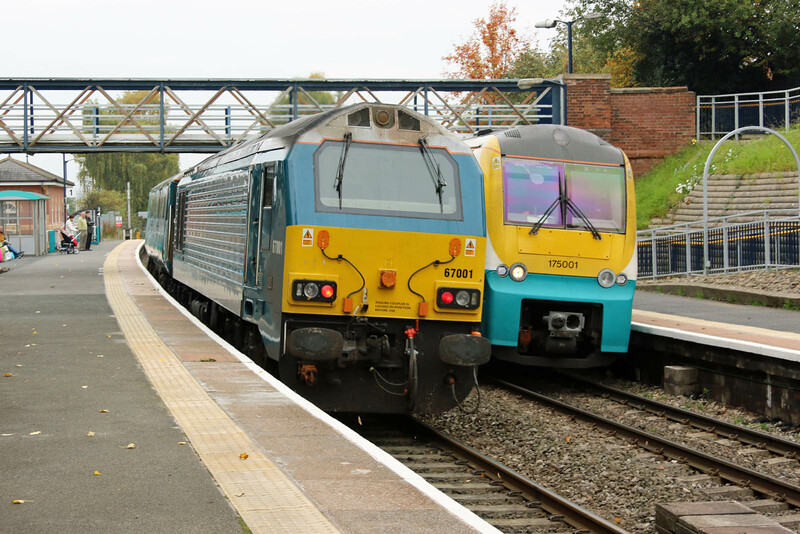 Leominster once had five platforms, now there are only two. 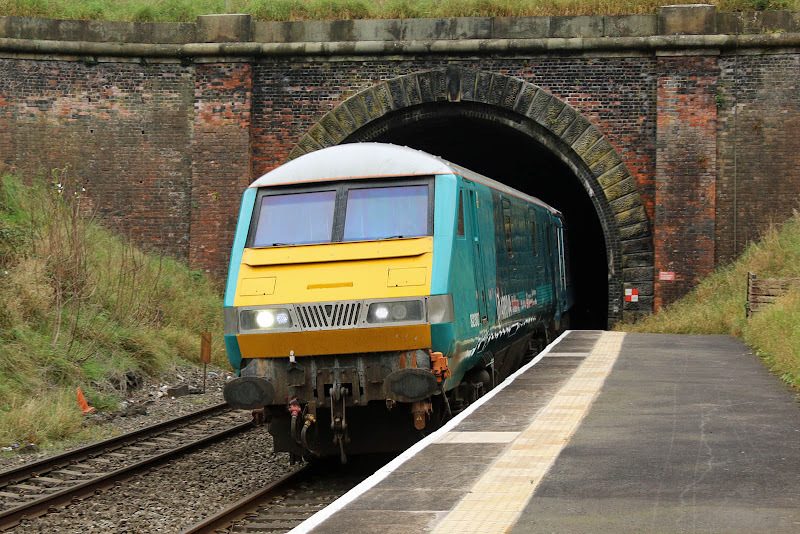 175105 arrives with 1V42 12:30 Manchester Piccadilly - Milford Haven. 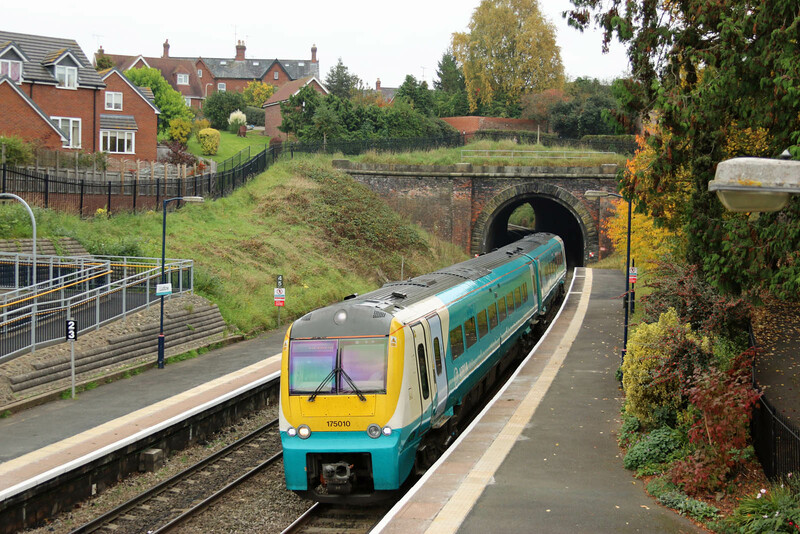 The 20 minute late running 1W16 11:10 Milford Haven - Manchester Piccadilly. 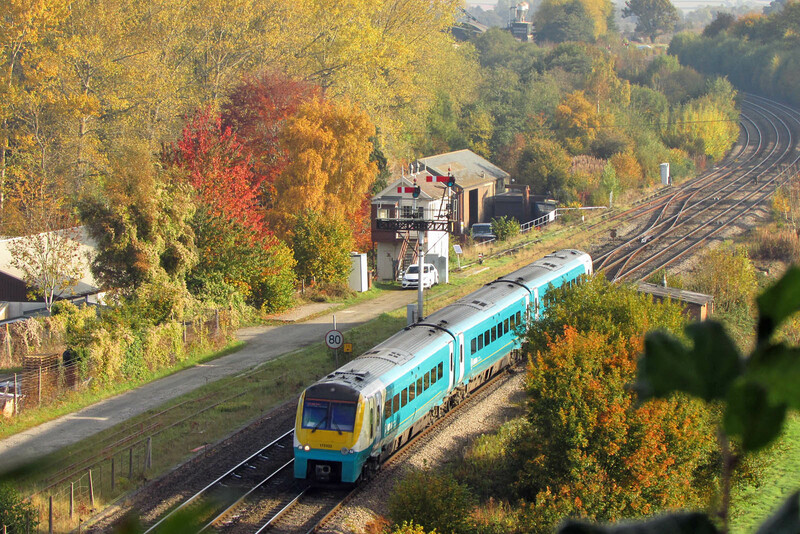 I was waiting for the Margam to Dee Marsh, but it was running too late for me. Full set on One Drive. 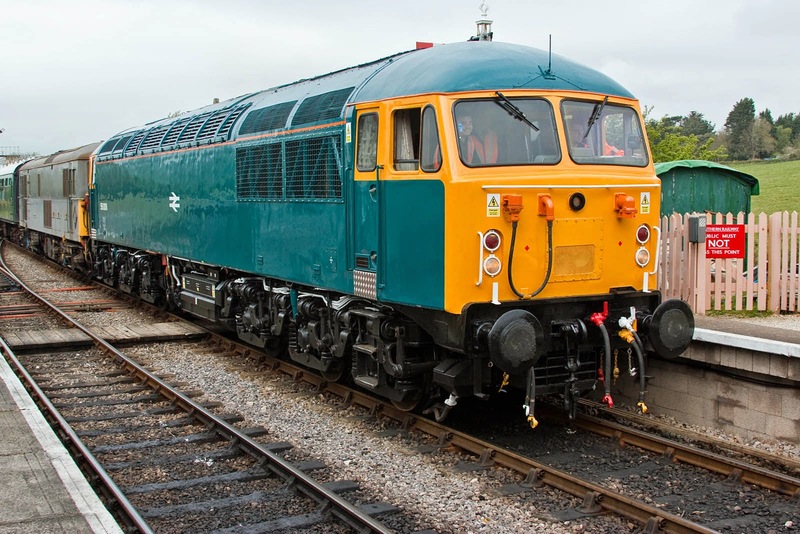 D9555, the last locomotive built at Swindon Works for BR service, 50 years ago in 1965. 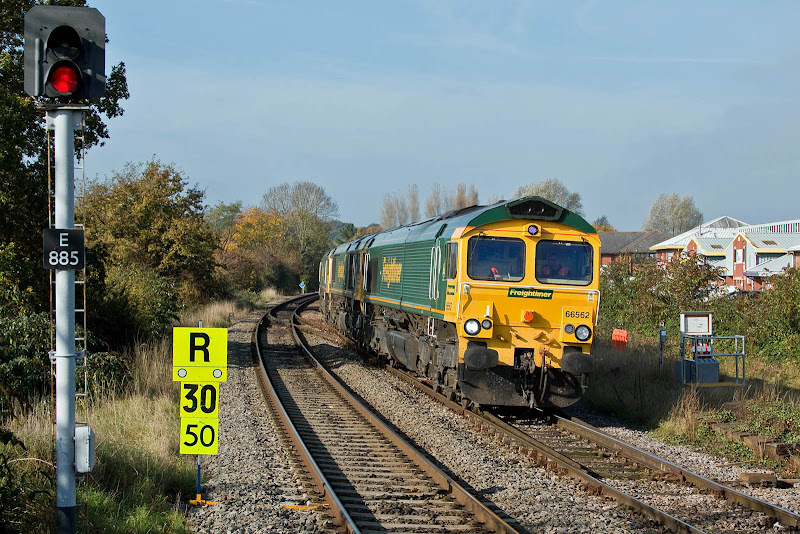 Seen running around at Lydney Junction. 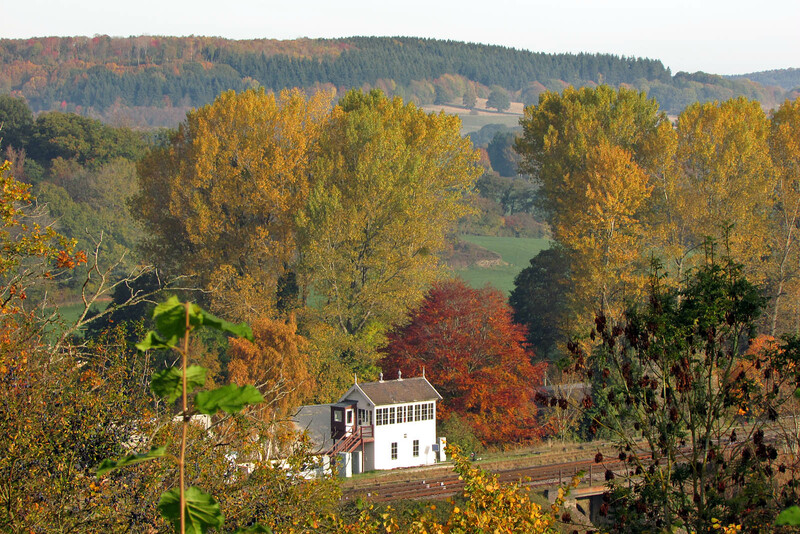 Running around in autumn colours at Parkend. 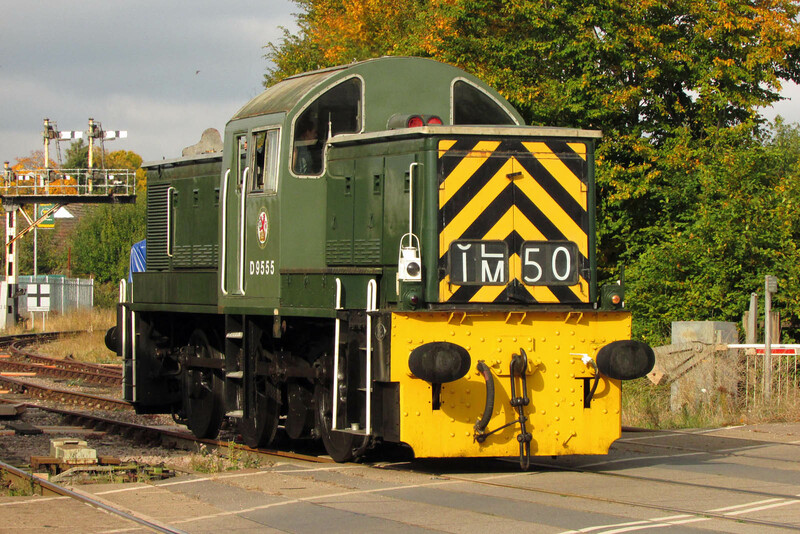 D9555 did work on this railway during its short BR career. 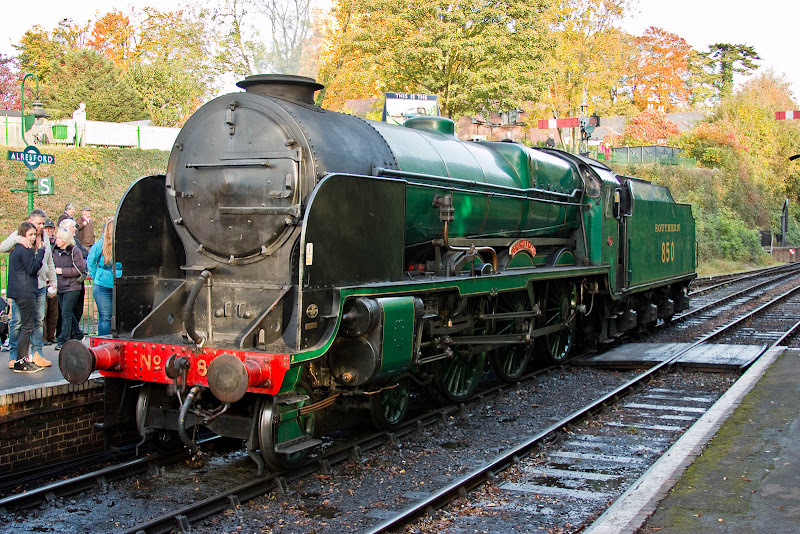 Wilbert (Hunslet 3806 of 1953), built for NCB service, at Norchard. Running around the dining train at Lydney Junction. 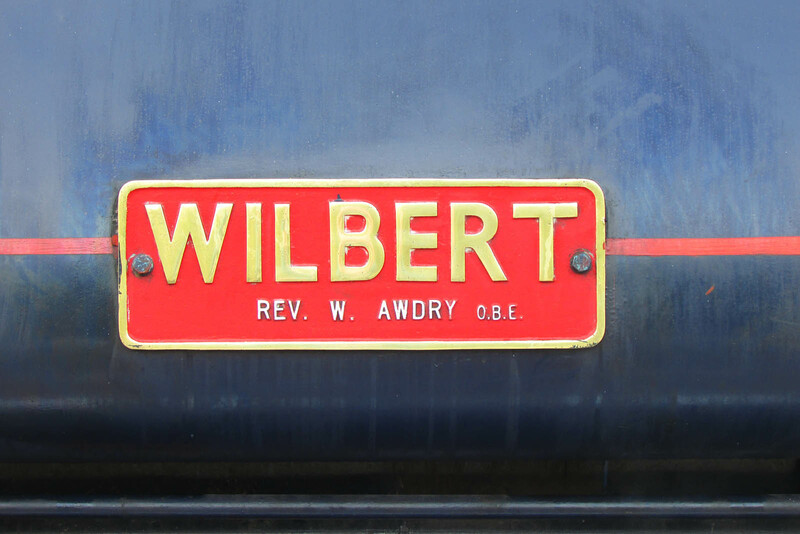 Reverend Awdry was born at Ampfield vicarage on 15th June 1911. 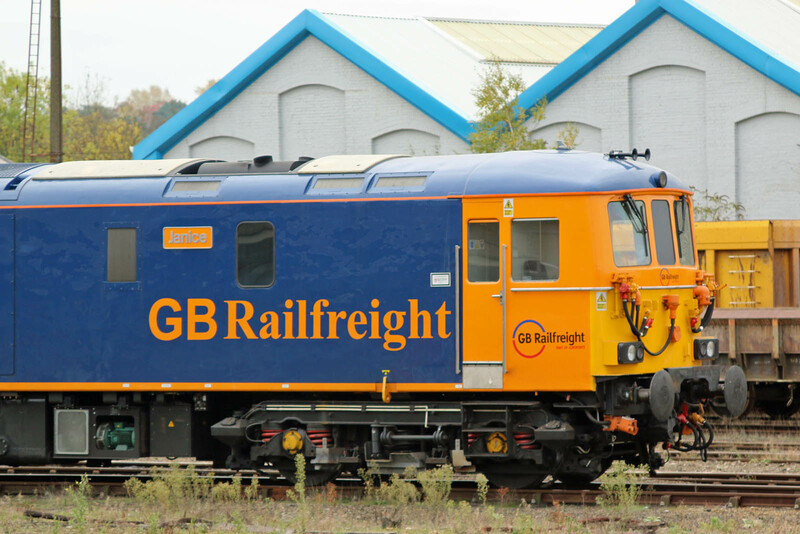 56006 was built in 1976 at Electroputere, Craiova, Romania, as subcontractor to Brush. It was handed over at Zeebrugge on 8th September that year, and in November worked some test workings. 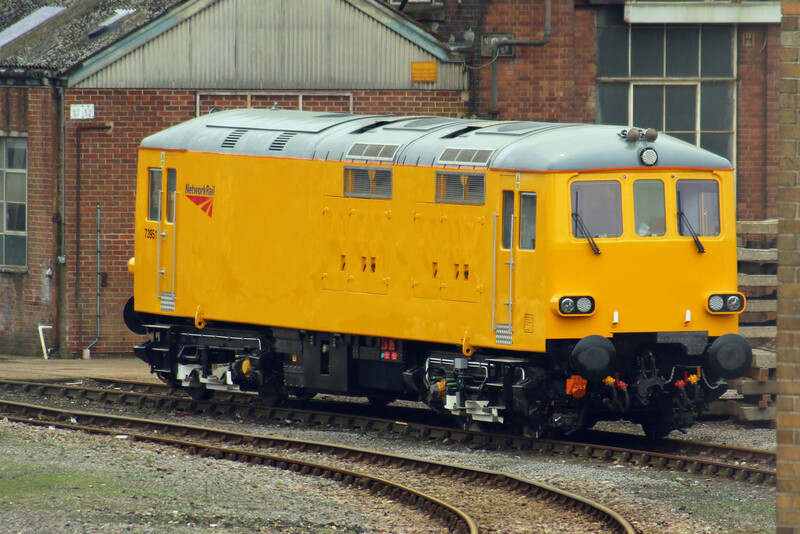 It entered traffic on 25th February 1977, the first of the class to enter service, following a number of rectification actions. 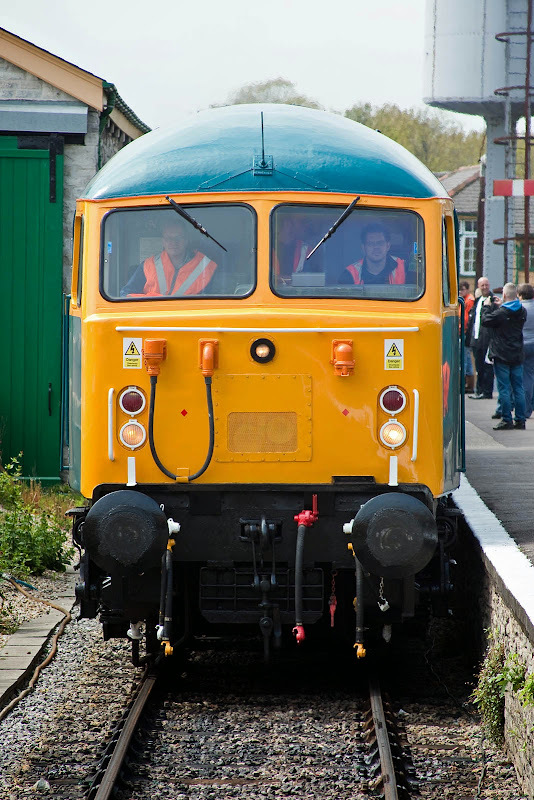 In EWS ownership the locomotive was used at a number of galas until withdrawn in December 2003, and was then kept at Barrow Hill, although it was sold to EMR in late 2011. 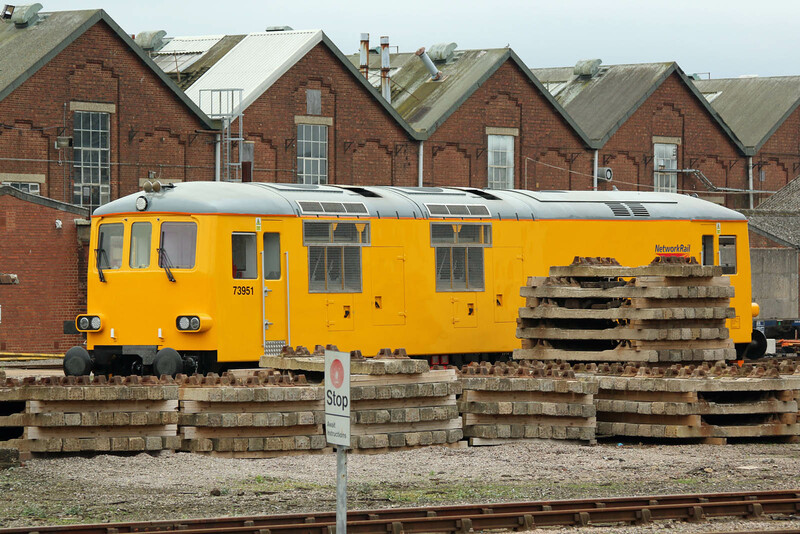 It was later sold to the Class 56 Group. 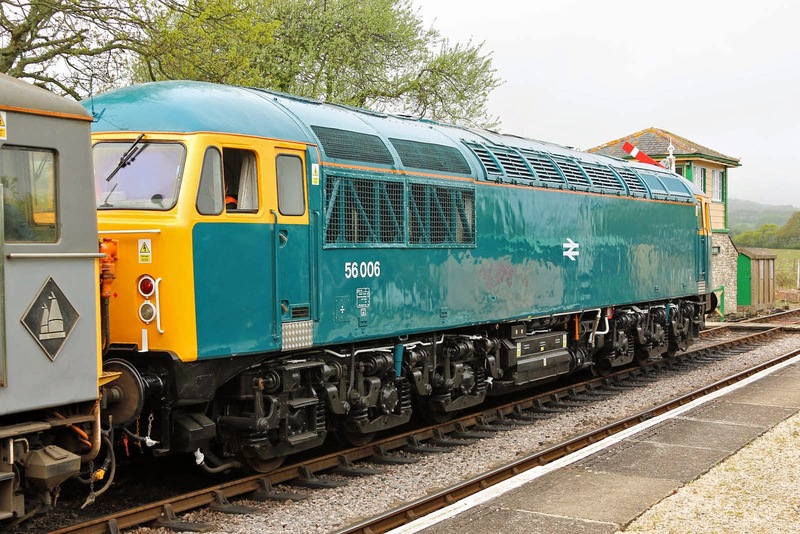 In July 2014 it was transferred to UK Rail Leasing at Leicester for repairs, from where it was picked up to take in convoy to the Swanage Gala. I first noted 56006 on 1st August 1982 on a southbound trip on the ECML. 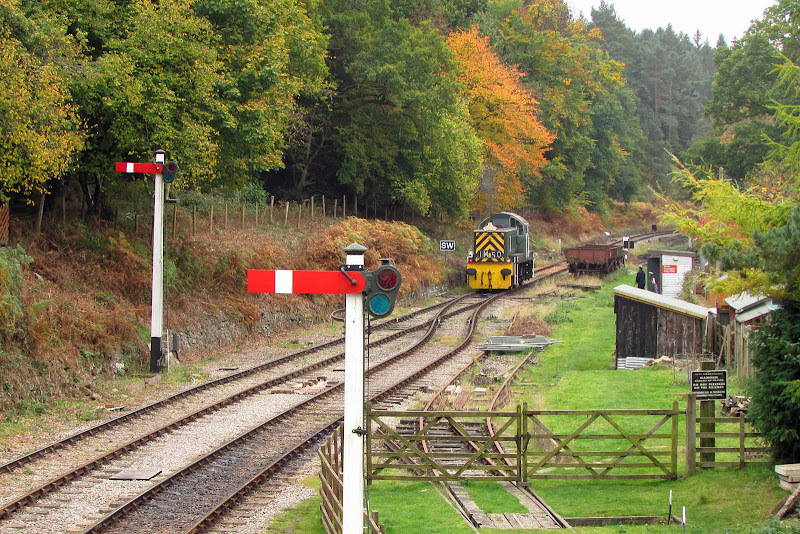 Leaving Harman's Cross with 2N04 09:15 fom Swanage. Returning to Harman's Cross with 1N01 10:20 from Norden. 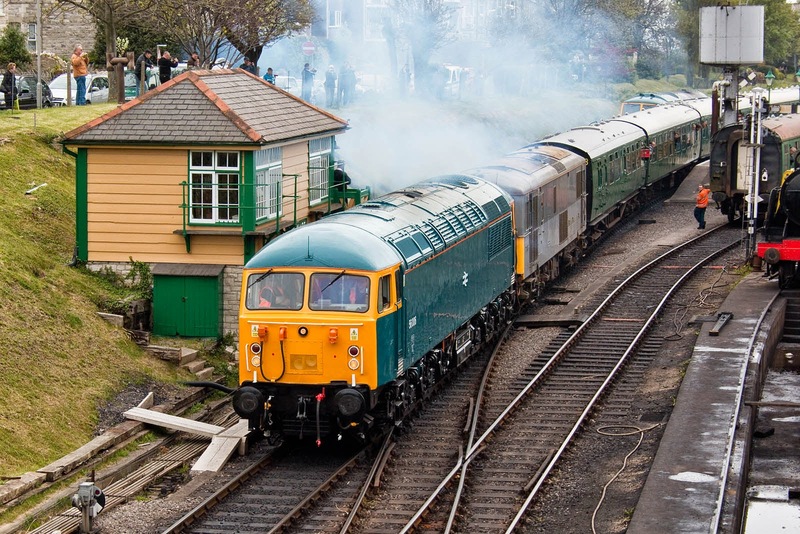 Preparing for 2N12 12:15 from Swanage. 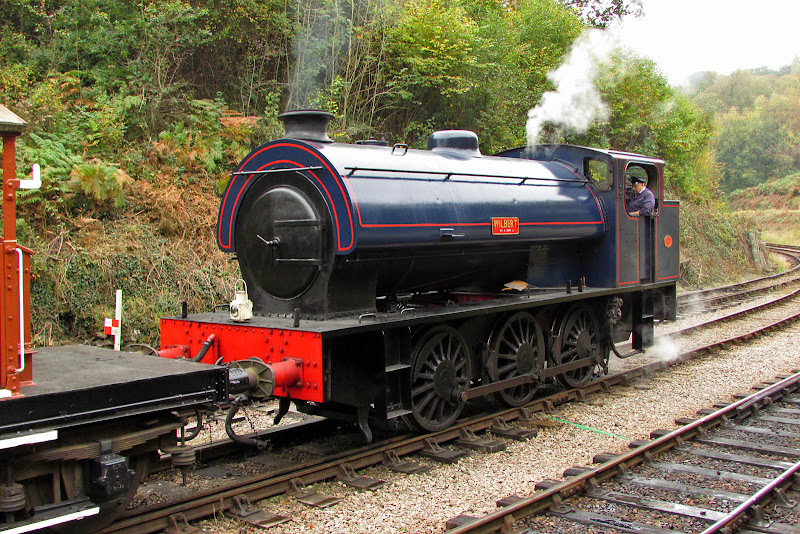 Returning into Swanage with 1N05 13:20 from Norden. Waiting in the platform having completed its duties at the Swanage Gala - next stop Didcot !